This is a campaign resource and log book for a group of D&D players in the UK. This is our first time playing a 4th edition game, based in a new homebrew campaign world that we are building together as we go, The Luquin Sea. 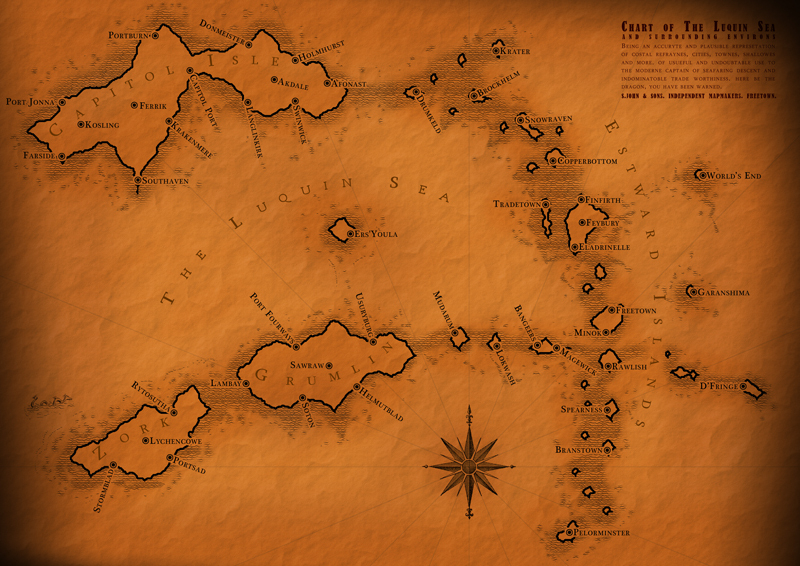 In short the world is a post-apocalyptic pirate infested archipelago. If you want to know what's going on in our campaign, currently the best bet is to read The Chronicals of Clan Medrash. If you enjoying this site or have any questions then we'd love to know. Goh Memoirs of Goh Harry Gardener? AzlorSeranicus The Book of Azlor Russell Hammond? SessionOne : 13/01/2009 : Escaping the destruction of Bangeers the characters defeat a sea monster only to end up shipwrecked on an unknown island. SessionTwo : 20/01/2009 : The party discover and infiltrate a tower full of goblin wreckers. SessionThree : 27/01/2009 : A room full of treasure and an office full of goblins. SessionFour : 03/02/2009 : Finally a ship and a way off the island. Unfortunately a black dragon as well. SessionFive : 24/03/2009 : Two whole pints? That's nearly an armful! SessionSix : 31/03/2009 : Caveat emptor! SessionSeven : 21/04/2009 : Onwards to Tradetown and Copperbottom. SessionEight : 28/04/2009 : Fighting tooth and nail for our own ship. SessionNine : 26/05/2009 : Zombies! Attack! SessionThirteen : 07/07/2009 : Ghost Fight! SessionFourteen : 14/07/2009 : Blood is thicker than water. SessionFifteen : 21/07/2009 : Who's gonna cook now? SessionSixteen : 28/07/2009 : To Drumkeld! For a quick history of our roleplaying group see HistoryOfOurGroup. that what norman did was a very suories offence! And the sentence would fit a younger healthier man! Even though cameron is about to allow filming in the courts? Allow! God i hate that word! They can film you evrywhere, even fly over your house and take a gander with all sorts of equipment, but you film them oh boy your a criminal! I'm glad he's out finally though, good luck to the old boy. Mar23bitpakkit I love the idea of design for execpirnee' also w/o caps!I find user execpirnee is only a strange term when it is capitalized to me the user execpirnee is simply the way we denote or subtitle information about the execpirnee a user has with something/anything. I have a user execpirnee regardless of one being intended or not. You can choose to study and affect it through other disciplines﻿ such as IA and Interaction/Experience/Service/Graphic Design. Hello! Ut sed erat at at orci fermentum semper. Donec arcu justo dictum quam rhoncus pellentesque at. Hi Iain, I've dropped you an email but I think it may have got lost in your spam filter again - did you receive it? Who are you Dn D Girl? Rhogar killed Kriv!!!1! No way!!1!!! Cant wait 4 update to Rhogars jornal. James, drop us an email and we can chat. See the contact page. I'm think there is room in our group, if Iain hasn't contacted you. I'll let him know you want to join. Hi! I've just moved to Watford and I am looking for a local D&D group. I really do not want to travel to London if I can avoid it. I've played forth edition before and really want to get back into the game. Do you have space for one more? Sure Mike, I've emailed you. guys u got space for one more... never done roleplaying before but id be up for trying if you dont mind a newcomer? The map is done mostly in Photoshop. I'll put some details on the LuquinSea page. hey, I am a DM in stafford, but that's not important, what is, is that I love your map. How did you make it? Really great start to a campaign here. Enjoying reading the journals.